The first game I am going to tell you about is Yeti in My Spaghetti. The great thing about this game is the family friendliness of it, it is ideal for kids of all ages and parents will be pleased to hear that it is very easy to set up. The aim of the game is simple, don't let the Yeti fall in the bowl. To play you take turns removing a noodle/strand of spaghetti, starting with the oldest player which Ben was very pleased about as he is a bit fed up with always having to let the twins go first. The game continues until the Yeti drops in the bowl. The concept of the game may be a simple one, but it does require some logical thinking and a steady hand. The kids quickly learned not to just tug and rip a random noodle out quickly. Yeti in My Spaghetti is like a cross between Jenga and Kerplunk except far quicker and less hassle to set up which is a big win from a parent's point of view. The Yeti itself is a very cute little guy, resembling a marshmallow with legs and you can have added fun by choosing to place him in different positions every time you play. There has been a lot of fun and laughter generated playing this game which it a clear indicator to me of what a big hit it is. 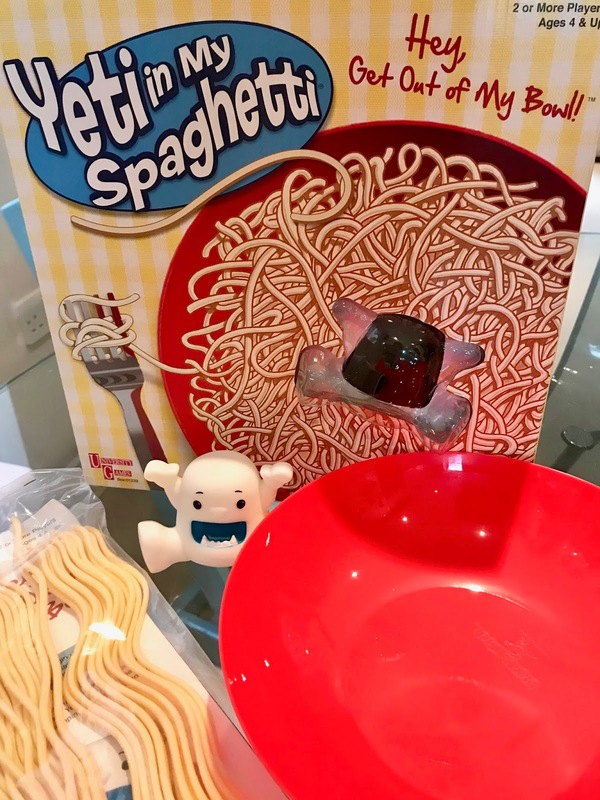 Spaghetti in My Yeti is available to purchase from the usual toy retailers including Smyths Toys and online from Amazon with an RRP of £14.99 and is aimed at ages 4+. 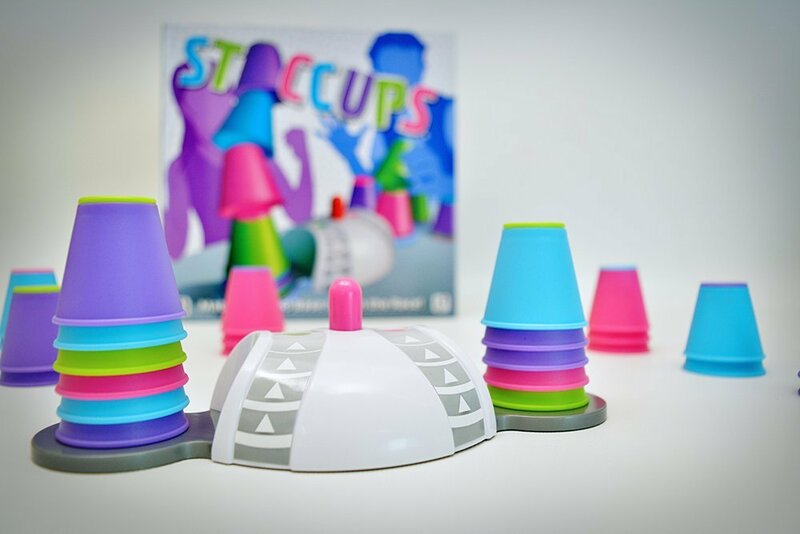 If you are after a competitive family game, then Staccups is for you. It is fun and fast-paced as the players have to race each other against the clock to see who is the fastest at stacking their cups. It definitely puts your reaction times to the test, with the added bonus of helping to develop hand-eye coordination. This game is suitable for ages 8+ years so perfect for Ben, but that said the twins who will be 5 next month have had fun playing against each other so I think as long as the skill/age level of opponents is matched younger kids will enjoy it too. Like all competitive games, Staccups teaches children a valuable life lesson that sometimes you don't win which I believe is good to learn through family games such as this one. Personally, I love the fun and competitiveness of Staccups and enjoy playing it just as much as Ben, I may even pull this out next time we have friends over for drinks as the appeal is definitely for kids and adults alike. Staccups is available to buy in store from usual toy retailers including Smyths Toys and online from Amazon with an RRP of £19.99 and is suitable for ages 8+ years. I am seriously impressed by the inventiveness and creativity of the makers of games like Googly eyes. I love the fun factor and the family appeal of it. 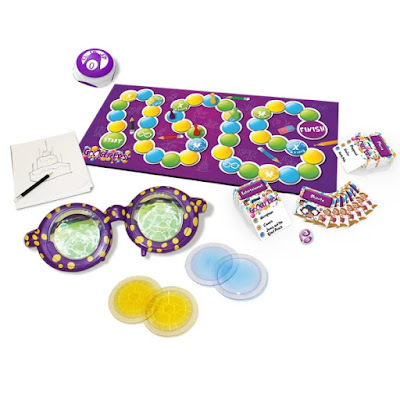 It is a crazy, fun drawing game that requires you to wear a pair of vision-altering wacky looking goggle eye glasses while attempting to draw a picture which your team then has to figure out what it is. It may sound easy but you will be surprised how wearing those glasses alters your drawing ability. During the game, everyone takes a turn to draw so everyone gets a chance to don the glasses which, if you ask my kids, is the best bit. The only problem is your kids may be reluctant to surrender the glasses at the end of their turn. 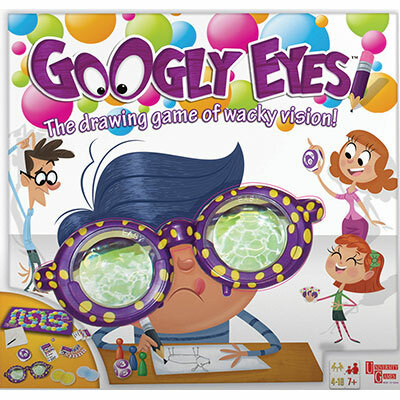 Googly Eyes is hilarious to play and we really liked the fact it was team based which allows you to balance the skill and age levels of both sides and keep it fair for all players. We really enjoyed playing this and had fun doing so recently when we had friends visiting. Some of the drawings were definitely verging on the abstract side. Googly Eyes is available to buy from retailers such as Smyths Toys and online from Amazon with an RRP of £19.99. 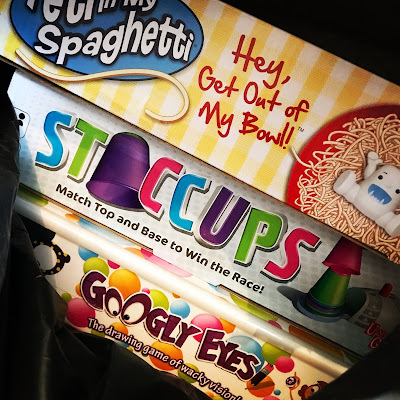 * Disclaimer: I received Yeti in My Spaghetti, Staccups and Googly Eyes for review. All views and opinions are my own and unbiased.